Many Brady Bunch fans were distraught over the fact that Jan Brady wasn't included in the first wave of Funko Pop! figures. However, they were just saving the best for last. The massively popular toy manufacturer has announced that Jan is getting her own set, including her imaginary boyfriend George Glass just in time for October's New York Comic-Con. The rest of the bunch will be available in stores next week. However, the Jan and George double set are New York Comic-Con exclusives. Funko really hit it out of the park with their Brady Bunch Pop figures. Each figure comes with the quality and detail that you've come to expect from the company, but the marketing behind this batch is pretty on point. 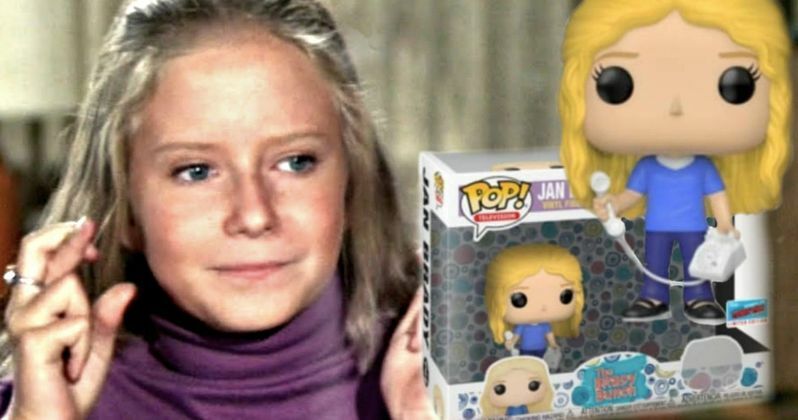 Leaving Jan out of the original Funko Pop Brady Bunch wave was seen as a pretty cruel move, especially since Alice is included. Funko released a description that reads. "Marsha, Marsha, Marsha! The Brady Bunch's Jan might have classic middle child syndrome but it's safe to say that will all be over when she realizes she's a New York Comic Con Pop! exclusive. Better still, Jan and her imaginary boyfriend George Glass are a Pop! two-pack." Jan Brady needed to create a fictional boyfriend in the television series, who she named George Glass. Jan was bummed out because her crush was much more interested in Marcia, so she decided to take it upon herself to boost her self-confidence. However, the Very Brady Sequel decided to turn George Glass into a real person, which helped Jan keep her charade up for even longer. Since then, the scene in the movie where Marcia grills Jan about George has become a famous meme, but mainly because of the way that Marcia says the word "school." Marcia wins again, even in real-life. In addition to The Brady Bunch Jan Brady and the imaginary George Glass, Funko is also releasing a pretty epic set of Married with Children action figures that are exclusive to New York Comic-Con this year. Thankfully, there's a whole set of the Bundys coming out in Pop! figure format that are slightly cooler than action figures. Both shows are iconic pieces of television history, from complete opposite ends of the spectrum that will look awesome together on a shelf. Marcia Brady, Cindy Brady, Bobby Brady, Peter Brady, Greg Brady, and Alice Nelson are all included in Funko's first wave of The Brady Bunch Pop! figures. Now that Jan Brady has been included with George Glass, fans are hoping that Mike and Carol Brady will be next alongside Sam the Butcher, Tiger the dog, and Cousin Oliver. It's unclear if Funko has any future plans to make more figures for The Brady Bunch line. While we wait to hear news about new additions, you can check out the Jan Brady and George Glass Pop! figures below, thanks to Funko.